Winco WDM009-301 Ardesia Linza Black Melamine Square Mini Bowl 2-1/2"
TigerChef > Dinnerware > Melamine Dinnerware > Melamine Serveware > Melamine Bowls >< Square Bowls > Winco WDM009-301 Ardesia Linza Black Melamine Square Mini Bowl 2-1/2"
✔ 2 oz. 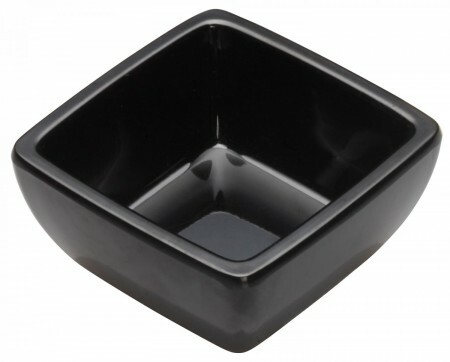 capacity✔ Color: black✔ Break-resistant, highly durable✔ Dimensions: 2 1/2"
Complement your specialty dishes with the Winco WDM009-301 Ardesia Linza Black Melamine Square Mini Bowl 2-1/2". This mini bowl is perfect for serving salsa and other condiments, as well as petite-sized appetizers and desserts, making it a versatile service piece in any food service venue. Boasting a smooth surface with a sleek black finish, this bowl adds modern elegance to any table setting. Perfect for restaurants or catering operations, this mini bowl is made from professional quality melamine that is virtually break-resistant and exceptionally durable.